of the white knights’ intravenous joist. until my feet are memory. be to lay & be, hum & die. Danez Smith is a Cave Canem Fellow, Pushcart Nominee, Survivor & Black Queer from St. Paul, MN. Danez was featured in The Academy of American Poets’ Emerging Poets Series by Patricia Smith & was a finalist for the 2013 RATTLE Poetry Prize. Danez is the author of hands on ya knees, a chapbook published by Penmanship Books. His full-length collection, [insert] Boy, will be published in 2014 by Yes Yes Books. His writing has appeared or is forthcoming in Poetry, Ploughshares, Devil’s Lake, The Cortland Review, Anti-, & elsewhere. 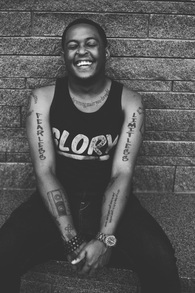 Danez started writing because of slams & necessity, & placed 6th in the world at the 2011 Individual World Poetry Slam & is the 2013 Rustbelt Midwest Regional Slam Champion. Danez twerks with the best, has no time for the rest. He writes & lives in Oakland, CA.